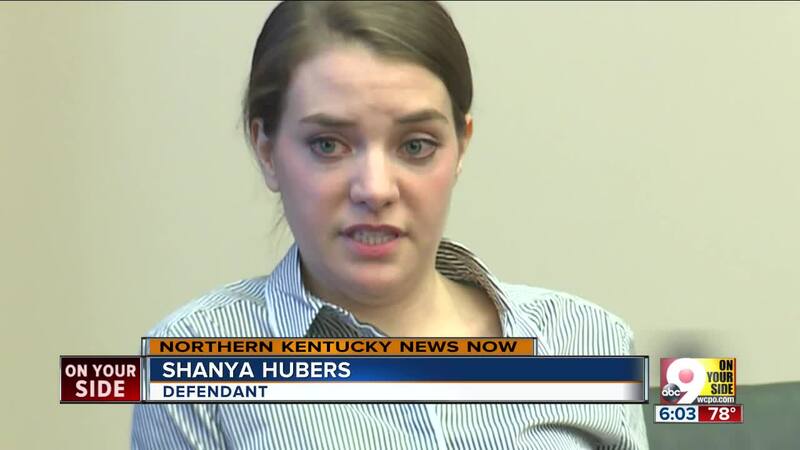 NEWPORT, Ky. - Not only did Shayna Hubers admit Thursday that she fired six shots while killing her boyfriend, she rather casually offered almost as many reasons for unloading the gun on him. Hubers, testifying for the second day in her murder retrial, originally told police she wanted to put Ryan Poston out of his misery after the 2012 shooting in his Highland Heights condo. She said Poston was twitching after the first shot and that it was too painful for her to watch. But under cross examination from Commonwealth Attorney Michelle Snodgrass, Hubers volunteered three more reasons. "One was that when I first shot him he let out a really loud noise that sounded like an animal. It was a very animalistic noise. I scared me. It freaked me out," Hubers said. "I also wasn't sure when I first shot him where the shots had entered or if I had just made him more angry and therefore he was more a threat - it would make the situation even more severe. "And thirdly, I had the mistaken belief that there was another gun on the table. And though there wasn't another gun on the table at the time, I thought there was." Snodgrass them reminded Hubers of a private comment she made after her arrest, when she said the shooting had given Poston the nose job he wanted. Snodgrass: “And, you were concerned enough for Mr. Poston that you wanted to make sure he didn't have to live with a deformed face, weren't you?" Hubers never mentioned those reasons directly to police following the shooting, saying that she was so traumatized and in shock that her mouth and her mind were in two different places that night. Hubers' bizarre testimony under cross examination contrasted with the smoothly scripted testimony she gave in direct examination, when her defense attorney was asking the questions. Hubers testified that there had been a violent struggle between her and Poston leading up to the shooting. It culminated, she said, when Poston pointed his gun at her and said he could kill her and get away with it. Hubers said Poston threw her across a room and grabbed her hair, leaving Hubers afraid he might break her neck. Hubers said she ended up sitting on the floor near the kitchen table and was stunned by what happened next. “I recall Ryan standing over me and grabbing the gun that was sitting on the table and pointing it at me and saying, ‘I could just kill you right now and get away with it. Nobody would even know,’ “ Hubers said. But Poston didn’t shoot. Instead, he set the gun back on the table and continued to yell hurtful things at her, Hubers said. Poston was in a chair at the kitchen table and Hubers said he started to stand up. “He was reaching across the table and I don’t know if he was reaching for the gun or reaching for me, but I’m still sitting on the floor at this point in time and I got up off the floor and I grabbed the gun and I shot him,” she said. Hubers said the day of the shooting began with Poston calling her mother stupid and crazy. Then, she said, Poston called her crazy, unstable and deranged. Hubers said when she went to leave his condo, Poston came at her with eyes that looked completely black. Things quickly got violent, she said. “He just grabbed onto my body, onto my person, with both hands,” Hubers said. “He picked me up from an awkward angle and threw me from the doorway of his bedroom into the other room all the way to the edge of the short sofa." Poston was 6-feet, 2-inches. Hubers is 5-8. In the ensuing struggle, Hubers said Poston fell on her and pinned her against a footstool. Hubers said he grabbed her hair and was screaming into her left ear. “I thought that he was going to snap my neck because of the way he was jerking my head around,” she said. “He had all of his weight on me." Hubers said she fell against TVs, but crime scene pictures show they weren’t disturbed. Hubers said Poston chased her and they began wrestling standing up. “It was horrible … I went to punch him with my right arm and when I went to punch him I believe I knocked his glasses off his face,” she said. She said the next thing she remembers is sitting on her bottom near the dining room table with Poston standing over her. But, on cross-examination, Snodgrass zeroed in on what she called inconsistencies in that story. Hubers finished her testimony about 4:15 p.m. and the retrial recessed for the day. It will resume at 11 a.m. Friday with more defense witnesses. Hubers surprised the courtroom when she took the stand Wednesday afternoon. She had not testified in her 2015 trial, when Hubers was convicted of murder and sentenced to 40 years in prison. But she was granted a retrial on the revelation that one of her jurors was a convicted felon. The defense's case hinges on Hubers' claims that Poston regularly abused her during their 18-month relationship. Hubers took the stand to counter the prosecution’s depiction of her as a dangerously obsessed hanger-on who preferred having a dead boyfriend rather than one who was dead-set on breaking up with her. The idea was to show Hubers as a traumatized abuse victim who killed her abuser to save her own life. Closing arguments and jury deliberations are expected next week. Go here for a recap of Hubers' testimony Wednesday.